‘Tis the season to be jolly. Put away those many hats you wear as chief problem-solver, fire putter-outer, and customer relations smoother-over and trade them in for your party hat, right? If your end-year M.O. is to make a great impression on management in order to move up the corporate ladder in the new year, you’ll want to maintain a professional demeanor despite the informal festive occasion. Office parties afford you the opportunity to schmooze with your associates and your supervisors and sometimes their spouses, too. Sure, the atmosphere is more relaxed than usual. But before you get down and boogie with your boss at the holiday office party, you might want to think twice before imbibing that second cup of Christmas cheer. Cautionary tales of holiday office parties run amok are the stuff that urban legends are made of. We’ve culled a few from the local Working World. All names and companies have been slightly altered to protect the privacy—and jobs! —of those involved. Rose M. from Glendale was up for a promotion at the L.A.-based financial company she worked at for 3 years. She thought that the office party might provide a perfect opportunity to impress her supervisors with her warm personality and popularity among her peers. Unfortunately, Rose took the “festive dress code” on the party invitation too far. The office party was being held on the roof bar at the Standard Hotel on a Friday night. Rose, 26, was planning to go out clubbing in Hollywood later that night with friends and dressed accordingly. Although her outfit was hip, expensive, and Rose looked wonderful in it, the décolletage and skimpy hemline of her party dress were more in tune with Britney and Paris than with the conservative corporate culture she worked in. “I made a mistake,” Rose said. “I thought that being at an office party was like being off-duty, you know?” Her male colleagues paid her too much attention and the other women she worked with were angry with her. “I didn’t get the promotion and I don’t think they took me seriously at work after that.” Rose plans to look for a new position after year-end bonuses are handed out. In Larchmont, Gary S. works for a well-known insurance company. His employer holds a dinner dance every December and employees are encouraged to bring their significant others. The dinner is lavish with an open bar. With drinks flowing and the lights down low, inhibitions tend to fall away and people forget that whatever happens at the holiday party is NOT going to stay at the party—it’s going to be talked about at the water cooler for weeks to come. After 4 vodka tonics Gary was out on the dance floor performing his best John Travolta moves. He was out there alone “stayin’ alive” until his boss’s wife, who clearly had also been drinking, came out to join him with some provocative dance moves of her own. We’re happy to report that even though Janice’s relationship was derailed soon after the party, her career is on track. Make sure yours is, too! 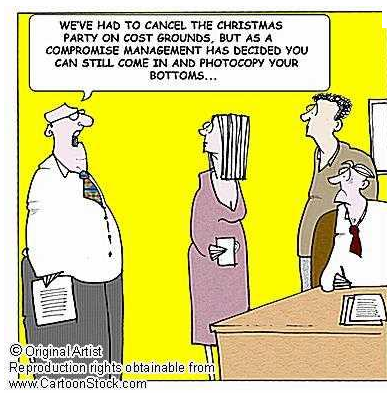 Please share your holiday office party disasters and other stories here in the Comments section, Happy Holidays!